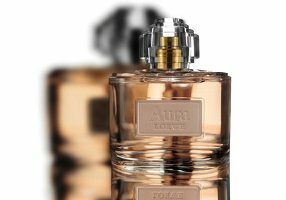 Spanish luxury brand Loewe will launch Aura, a new fragrance for women, in September. Aura will be fronted by model Linda Evangelista, and appears to be unrelated to an earlier Loewe fragrance of the same name. Notes for the floral fragrance with fruity and oriental accents include rose otto, sandalwood and Atlas cedar. Loewe Aura will be available in 40 ml Eau de Parfum; I will update with additional sizes when I can. Update: Aura is also available in 80 and 100 ml. With Evangelista fronting, their target customer for this one must finally be more that just the 16-24 group. At 48 Linda looks amazing. Yes, nice that they’ve chosen an older model, and she does!